Spring basketball signups start soon for the Girls Spring Basketball League at the Boys & Girls Club of Laguna Beach-Main Branch. The cost for Club members to participate is $150 per player, which includes a new team uniform. Non-club members who wish to participate for the spring season will be required to pay $150, plus yearly Club membership ($100). Registration takes place Feb 1 - 28. A late fee will be applied for all registrations after Feb 28. Scholarships are available for qualifying families. Player evaluations are mandatory and will be held the week of March 5 - 8. Thereafter, teams are formed. One-hour practices begin March 26, and games will start on April 10. Boys & Girls Club Athletic Director, Hans Laroche, has an outstanding reputation among both Club kids and parents for making this league a great experience for everyone involved. From grades Kindergarten through ninth grade, all participants learn basketball skills, enhance their self-esteem and have a great time being part of a team. Volunteer opportunities are also available for parents interested in coaching teams. It is the best instructional basketball league for girls around. Annual sponsorship opportunities that support Boys & Girls Club Athletic programs are available. For just $500, your family or business name can be displayed on a colorful banner hung in the Club’s gym for one year. These banners are seen by more than 600 Laguna families each year. For more information or to become a member, call 949-494-2535 or go to www.bgclagunabeach.org. The LBHS Surf team members were very strong on Sunday at the Scholastic Surf Series Event #3 and made the Individual Finals in all four Divisions with multiple winners. Once again, with a smaller than normal group, many of the kids available competed successfully in multiple divisions. Early in the morning In team competition LBHS was up against J Serra and did very well with most of the team advancing on to the Individuals, and we were able to take a big win 63 to 25. The event was held at Ninth St in Huntington Beach and the weather was gorgeous with hot offshore winds. The two-three foot surf was clean looking, but very difficult to ride. Once the Individual competition kicked in the LBHS surfers clearly stood out and were the surfers to beat. In Boys Shortboard, Travis Booth, Liam McCue and Jackson Jenkins all took wins advancing to the Finals. Once the Finals hit the water Travis continued to shred a number of lefts and rights and was on top of his game taking the overall win. He did double duty and took third in Bodyboard. Meanwhile Liam had some impressive rides and finished runner up, while Jackson was another surfer to take on multiple divisions with huge success, taking the win overall in Longboard and fourth in Shortboard. Jameson Roller was a standout in several heats in Longboard, but in the end finished fourth. Tess Booth continued her run competing in both Shortboard and Longboard to take both big wins. Meanwhile Jade Howson took secon in Longboard and Kelly Smith took third in Shortboard, both putting in some nice rides. Other surfers to do well but not final were Sam Starr and Joseph Schenk. The next Scholastic Surf Series event will be Feb 11 at San Clemente Pier. Thank you to the kids who participated and the parents, and friends who helped out. On Fri, March 23, St. Catherine of Siena Parish School will celebrate its sixtieth anniversary at the Port Theater with A Starry Night Gala. There will be a live and silent auction, dancing, gaming and music by one of Orange County’s favorite DJs as well as delicious food and drinks. Cocktail attire is suggested. The event takes place at 6 p.m. The Port Theatre is located at 2905 East Coast Highway, Corona Del Mar. All funds raised will go directly towards school programs and facility needs. “The Sixtieth Anniversary Starry Night Gala brings families together to build camaraderie, celebrate Saint Catherine of Siena Parish School and raise money to support the spiritual, academic and artistic development of our talented students,” said principal Mike Letourneau. “Throughout the years, the event has raised money to support new academic, technology, artistic and faith programs that benefit all of our students, many of which would not have been possible without the generous support of our families, parishioners and local businesses. St. Catherine’s is a 501 c (3) non-profit, Catholic elementary (TK -8) school located in Laguna Beach. Laguna Beach High School counselor Nichole Rosa has been recognized for her exemplary work as a professional school counselor in the Laguna Beach Unified School District by the College Board’s inaugural 2018 Counselor Recognition Program (CRP). In an effort to showcase how school counselors throughout Orange County are making a difference in creating opportunities for all students, the College Board, in conjunction with the Orange County, California, Department of Education, launched its first Counselor Recognition Program. The award seeks to highlight the important work of innovative, results-oriented school counselors who exemplify excellence and commitment to student success and opportunity. “Mrs. Rosa and the entire counseling team offer amazing support, guidance and care for the students of Breaker Nation,” said Dr. Jason Allemann, principal at Laguna Beach High School. “It is great that our students are able to use the expertise and resources that our counselors have to offer them,” he added. The evaluation committee selected Rosa for her commitment to ensure that all students have a specific, solid, and attainable plan upon graduation that includes postsecondary options. In addition, the committee praised Rosa for the framework she has built to support students’ comprehensive success by leveraging diverse partnerships with community organizations and individuals to disseminate critical information about financial aid and scholarships. As a recipient of the award, Rosa was presented with an all-expenses paid complimentary trip to the American School Counselor Association (ASCA) Annual Conference in Los Angeles this July where winners will be recognized. Boys & Girls Club of Laguna Beach (BGCLB), Canyon branch presented the first annual “AZUL Leadership Awards” during the Youth of the Year Awards ceremony on Feb 2. These distinguished awards recognize the staff who demonstrate exceptional leadership beyond their position description and through accountable measures in their daily performance in 2017. AZUL stands for: “Be the Change. Embody your ideals and set the cascade of transformation in motion. Empower PoZitivity. Positive mind, positive vibes, and positive life. The Boys & Girls club strive to create an environment that allows members to make positive choices. Youth-Centric. Embrace challenges that lead to a better experience for the kids and empower them to explore, discover, fail, and learn. If a kid can do it, a kid should do it. Embrace diversity. Foster a culture of respect, equality and inclusiveness, and celebrate that we are all unique beings. Creative togetherness. The sum of the parts (Innovation + collaboration) equal more than each quality on its own. Staff had the opportunity to nominate their peers for these awards as a reflection on how they work, live and breathe these values to attain the Club’s goals each day. Sophia Abjuga, Lang Unit Coordinator and a former a youth development professional, she (in less than 18 months) has demonstrated the desire to learn their new role, is approachable and friendly, participates with activities/meetings/events, and is involved with planning, safety, housekeeping and organizational improvements while embracing the mission. Mar Stash is the fine Arts Youth Development Professional/Creative Marketing Coordinator at Bluebird Branch, who consistently exhibits a positive, spirited “can-do” attitude and outlook, GREAT energy and enthusiasm that colleagues, club members, and volunteers (and others) alike find contagious and uplifting. Mar is the person that people are drawn to get the job done, and receive a motivational pep talk or a high five! Art Expressions Director at the Canyon Branch, Caitlin Reller embraces impact, service, dedication, professionalism, accountability and compassion in dealing with internal or external customers (staff, kids, parents, partners, volunteers, guests, donors). In addition, Caitlin inspires an overall sense of belonging, usefulness, influence and competence that leads to a welcoming club/organization environment. Program Development Director at the Canyon Branch, Jesus Villegas exemplifies the kind of collaboration, teamwork and respect it takes to make others great! He leads by example, is passionate about the mission and helping their fellow employees succeed and reach their goals. The Boys & Girls club is thrilled to announce these winners and welcome the community to congratulate them on their achievements. For more information, contact Addie McHale at (949) 715-7669. To become a member, call (949) 494-2535 or go to www.bgclagunabeach.org. The LBHS Surf team members were very strong today (Feb 11) at the Scholastic Surf Series Event #Four with several top finishes in the individual finals. Once again, it was a smaller than normal group, as many of available kids competed successfully in multiple divisions. The day started out with team competition, and we were up against El Toro who had a limited team. It was mostly a chance for the Laguna surfers to get some good practice in before the individual competition began. We ended up taking a lopsided team win 62 to three. The Laguna surfers were on a roll, surfing well and progressing to the various finals. Our women continued to sweep the shortboard and longboard finals, going one and two. Kelly Smith took the shortboard win, followed by Claire Kelly in second. Jade Howsen took the longboard final with Maya Takabayashi taking second. Our men were also very strong with multiple division finalists. Kiko Nelsen led the way, taking first in longboard and third in shortboard. Meanwhile, other impressive performances were put in by Lucas Jablon, taking fourth, followed by a first-time finalist Luca Elghanayan, who took fifth. Sam Nelsen rounded out the final in sixth and again took a sixth in longboard. Joseph Schenck was another surfer to do double duty and made the finals in longboard taking fifthoverall. The event was held at San Clemente pier under sunny skies and glassy small surf in the morning, but as the tide bottomed out for finals, it was tough to find decent waves. The next Scholastic Surf Series event will be March 18, and the High School Championships will be April 21. Thank you to the kids who participated and the parents, especially Ellen Nelsen for her support and great action shots! Irene White, director of special education for the Laguna Beach Unified School District, was named 2018 Special Education Administrator of the Year by the Association of California School Administrators Region 17, which covers Orange County. ACSA is the largest umbrella organization for school leaders in the nation with Region 17 focused on serving educational leaders in the pursuit of equity and excellence to meet the diverse needs of all students in Orange County. One of ACSA’s priorities is to ensure that school leaders are recognized for their excellence and dedication to public education; administrators of the year are selected for their outstanding performance and achievement in their respective categories. “I am so proud that Irene was selected as the ACSA Special Education Administrator of the Year for our region,” said Superintendent of Schools Dr. Jason Viloria. He continued, “She deserves the recognition for her tireless efforts to support our students and staff in providing a supportive learning environment. She is focused on continuously improving our programs in LBUSD and I am privileged to work with such a great educator.” White was nominated by school psychologist, Luisa Mossa, and surprised with the award announcement by Superintendent of Schools Dr. Jason Viloria, Board of Education President Jan Vickers, assistant superintendents, and staff. “I am truly honored by the recognition and excited about the work currently in progress in our District,” said Director of Special Education Irene White. “In the eleven years, I have worked in Laguna I have been fortunate to work alongside some of the most intelligent and committed administrators, support personnel, specialists and teachers. I personally take great pride in partnering with our site level staff and parents in creating successful programs and supports for our kids. My dedication to our schools remains strong and I am wholeheartedly committed to engage and lead our ongoing efforts in improving outcomes for students. I am grateful to be in Laguna,” she added. ACSA Region 17 will recognize all award recipients at the Orange County Administrators of the Year Banquet on May 7 in Irvine. Last weekend at the Winterfest 2018 Water Polo Tournament, Laguna Beach Water Polo Foundation teams won first place in their respective divisions. For division 10U Coed-Dylan Williams, 12U Boys-Riley Treister, 12U Girls-Emerson Hensley, 14U B Girls-Lexi Parness, and 14U A Girls-Genoa Rossi respectively were named as MVPs. Led by six seniors and a standout freshman, the LBHS Boys Basketball team (26-3) has shattered just about every team record in school history this year, including the most regular season wins at 25. The team also went undefeated in league play. After posting a decisive 63-47 victory over Santiago in their CIF Playoffs opener on Wednesday, the team will now face Twentynine Palms (21-8) in the Second Round of the CIF D3AA Playoffs tonight, Friday, Feb 16 at 7 p.m. at home. Coach Bret Fleming, in his 23rd year as LBHS Boys Varsity Basketball coach, attributes this year’s historic run to “chemistry and defense”. “I think it probably starts with chemistry. The kids generally really care about each other, they love each other and it shows. Everybody’s kind of learned what each other’s qualities are and how to play together, the teamwork and stuff. That type of thing really shows with the seniors,” said Fleming in an interview. The “senior six” includes Blake Burzell, Charlie Rounaghi, Owen McMurray, Grady Morgan, Adam Armstrong, and Blake Lusk. A number of them have been playing together since grade school at Boys & Girls Club. And that, says Coach Fleming, has made the world of difference with this group. Burzell is averaging about 21 points per game and is leading the team in rebounds, and Charlie Rounaghi is second in the county in assists at 6.8 per game. “The thing that’s been so incredible about Charlie is he’s averaging about 4 1/2 assists to turnovers per game. He’s really been a key for us this year,” said Fleming. The team also has four players averaging between eight and 11 points per game (Grady Morgan, Charlie Rounaghi, Owen McMurray, and freshman Nolan Naess), which makes them very well-rounded and difficult to defend. The next step for the team in continuing its historic run comes tonight against a very athletic and physical team in Twentynine Palms. The Wildcats come in with a 21-8 record (9-1 in league play), despite losing their coach at the end of the year in a dramatic resignation. Show your Laguna pride by showing up tonight (Friday) at 7 p.m. at Dugger Gym. 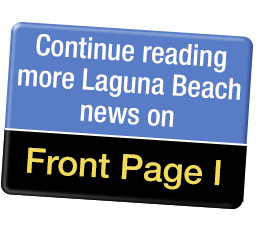 The Laguna Beach High School Boys Basketball team dropped a heartbreaker at home on Friday night, losing by three points (57-54) to Twentynine Palms, knocking the Breakers out of the CIF Playoffs and ending their historic 2017-2018 season run. The Breakers trailed most of the game, but fought back in the third and fourth quarters to take the lead briefly on a few occasions. Ultimately, however, the Wildcats prevailed, winning 57-54. To the “senior six” and the rest of this year’s team…your community is very proud of you for all that you achieved this year and throughout your entire Laguna Beach career!